I will be at PrezCon in Charlottesville, VA from Thursday through Sunday. I'm scheduled to give a talk and question/answer session about game design at 9PM Friday. "In England, as here, there are always two kinds of audiences: the Royal Shakespeare and the West End. In the last 10 years, audiences have been changed by television. One can tell: people don't concentrate and they expect lighter fare - and I do hate disappointing the audiences. One lady came up to me afterwards here [NY], very complimentary, and then she said 'Well, this is terribly heavy.' And I thought 'Oh dear, you think this is heavy? Because it isn't, it's just serious.'" Gameplay depth, which requires concentration and planning and some attention to detail, tends to be "terribly heavy" entertainment these days. "Copy-cat" games--direct, blatant clones--are a big problem in the video game industry, especially the small games popular on Apple iOS. For example see http://www.gamesindustry.biz/articles/2012-02-06-apple-removes-cloned-games-from-app-store . Long ago, Diplomacy was cloned in Brazil (with the addition of a supply center somewhere in the south, I think). I recall seeing an ad a couple years ago for a game called something like "Tetris the Strategy Game" that was clearly a blatant copy of Blokus, but I don't follow publishing closely enough to hear of other examples of cloning. Is cloning becoming a problem on the tabletop? 5th edition D&D is supposed to unify the editions so that players can customize the game to suit their tastes, whatever edition they prefer. But I notice that to comment on Monte Cook's discussions, you must be a subscriber to D&D Insider, so people who aren't 4e fans (Insider subscriptions are for 4e players) are excluded. "Multiplayer solitaire" is usually a case of a puzzle that's been turned into a contest. A contest is any activity that can be timed or assigned points, or measured in some other way (as in how far a coin falls from a wall or how far one can throw a baseball). If two or more people try to beat one another's performance in this, and have no way to hinder or help other participants, then you have a contest. Another example, type for five minutes and whoever types the most words wins the contest. Races are much like contests, but include some method (if only blocking) to hinder an opponent. Contests, in and of themselves, are not games. There is no design involved. Games and puzzles require design. For generals and admirals, war is a lot of risk-taking in the face of high uncertainty. There's sometimes a strong element of "yomi", reading the intentions of the other side and taking advantage of that. Chess, in contrast, is full of certainty, with nothing hidden other than the intentions of the other player. As Patrick Carroll says, "Chess players have the advantage of lots of 'live practice.' Generals don't. There just aren't enough wars. Of course, this relates to the issue of friction, that study does not equal reality. " Someone tweeted "sometimes I feel like @lewpuls just doesn't like euro games, and he tries to justify this by denigrating them." Say what? Obviously I don't care for them as a category. No, I don't have many good things to say about them. Yet I certainly have no need to "justify" my dislike, any more than I need to justify dislike of coconut or extremely horrific movies or regular-season baseball. Did the poster assume that Euros are "good" and anyone who dislikes them has to justify being "ungoodthinkful", as Orwell would say? The odd thing is that some people (not necessarily this tweeter) take it personally. If you like the kinds of games you like, what the hell do you care what someone else says? I don't frenetically blast away as Michael Barnes used to (eloquent as he could be), I try to explain. But not over and over when someone is convinced that I'd like the games if I just really understood them. I do understand them, and I don't like them, *as a category*. They do not supply what I am looking for in games, in fact for me many of them are much closer to puzzle-contests than to games. I don't much like puzzles. I received a PDF of McFarland's spring 2012 catalog listing my book "Game Design: How to Create Video and Tabletop Games, Start to Finish". I'm guessing it will be out in spring or summer; at this point I have not received galleys nor have I made the index. Web site at http://www.mcfarlandpub.com/book-2.php?id=978-0-7864-6952-9 . Why would you read a book? When I was a kid in the 50s and 60s, as for generations before, a book was a treasure trove of information, something to be read carefully and absorbed as much as possible. While the book is no longer the absolute treasure trove, it still organizes information in an easily digestible form. But more important, a book can convey the experience of the author to the reader, and if that experience is valuable then this is something the reader won't get anywhere else. 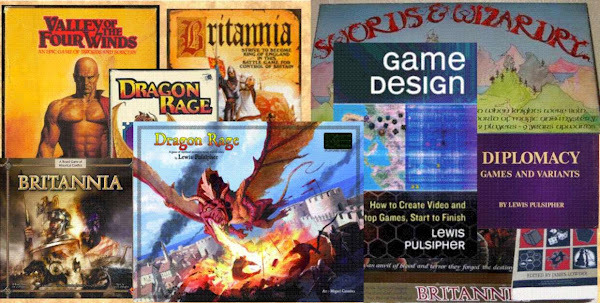 A major purpose for me in writing the book is to help beginning game designers avoid the "school of hard knocks" that I had to go through, applying my experience in teaching novice game designers as well. Nowadays people are much less impressed by books because there are so many other sources of information, but if you really want to learn about something in depth a good book is probably the best way to do it other than having an experienced person teach you directly. The Web and computing in general have brought about a mindset that "digital should be free". Fortunately tabletop gaming is relatively immune to this, because a tabletop game is a very tangible product. But what will happen in the long run with video games, especially now that so many are free-to-play? Will the "digital should be free" mindset ultimately drive many of the AAA video game makers out of the AAA business because they won't be able to successfully charge $60 or so for a game? If it does happen, that won't necessarily be a Good Thing, but market forces often cause Bad Things to happen. I was the guest on the Ludology podcast #26 about epic tabletop games (not about the video game company). It was posted Feb 19 (find it on BGG or search for "Ludology podcast site"). Ludology is the only podcast I listen to, because it's about "the why of games", not about new games or community chit-chat or fanboyism. I am gradually extracting my old articles from various game magazines to compile three novel-sized books. Often because of poor scanning or weak OCR I have to make quite a few corrections so I'm reading some of it as I go along. It's always interesting to read something that you wrote as much as three decades before, though I'm glad to say that I usually agree with myself. :-) Most of what I'm working on is RPG material and I see that much has stayed the same over three decades. I need to find a 50-60 year old dictionary and look at the definition of "trial and error". To me it means guessing at a solution, trying it, and then if it doesn't work, guessing at another and trying--until you get lucky and guess right. But dictionary definitions now are broad enough that the scientific method, which is quite different from guessing, could be called trial and error. Someone suggested the substitute phrase "guess and check", so that's what I'll try to use from now on. "T&E" appears to be yet another phrase whose meaning has changed significantly over time. One of the disadvantages of writing articles for magazines, such as “Against the Odds,” is that it can be literally years from the time it is submitted to the time it is published. I recently sent ATO an article about different kinds of war related games, and I’m going to briefly categorize its 4,000 words in 400. I will not respond to any comments here, sooner or later the full article will be published. Games such as Conflict, Risk and Chess fall into this category. ● very few "realistic" or real world restrictions on what you can do--"freedom to do whatever you want"
Take it as it is, please, I am not at liberty to discuss it further.